This full-day trip from Boston provides convenient access to one of New England's most-popular destination--Plymouth. Sit back and relax on a ride out of Boston and from Plymouth while spending a day away from the hustle and bustle. In the morning, purchase and take a 3-hour whale watch cruise, to see the magnificent, largest mammal--Whale. 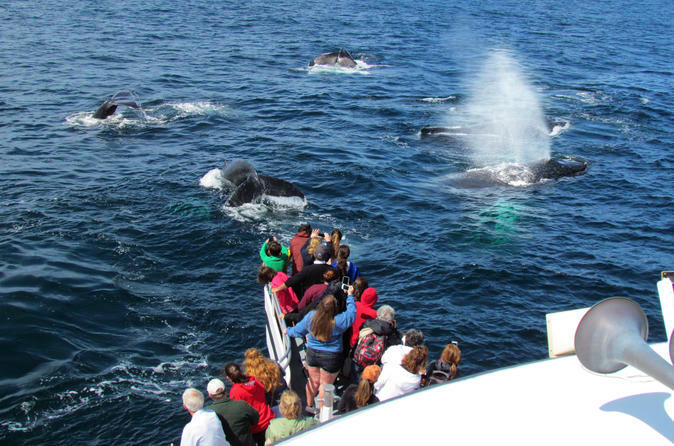 During the cruise, an interactive introduction of Whales and whale fishing history will be conducted. Afterwards, next stop is Plymouth, MA to visit Plymouth Rock and Plimoth Plantation. At your own expense, explore a 17th-century English Village, a recreation of the small farming and maritime community built by the Pilgrims along the shore of Plymouth Harbor. Visit Plimoth Grist Mill, which was built by the Pilgrims in Plymouth Colony. After more than a decade of laboriously grinding corn by hand in wooden mortars, the colony authorized the construction of a water-powered corn grinding mill on Town Brook in 1636. Discover how the 17th-century Wampanoag would have lived along the coast during the growing season. The day trip will conclude with transportation from Plymouth back to Boston that evening. Please note that the tour price includes transportation only and does not include admission fees to Plimoth Plantation, Plimoth Grist Mill, or the Whale Watch Cruise. These will need to be purchased on site.